Wells Fargo & Co. (NYSE:WFC) last issued its earnings results on Friday, October 14th. The financial services provider reported $1.03 EPS for the quarter, topping the consensus estimate of $1.01 by $0.02. Wells Fargo & Co. had a net margin of 23.91% and a return on equity of 12.72%. The company had revenue of $22.30 billion for the quarter. During the same period in the previous year, the firm earned $1.05 earnings per share. The firm’s quarterly revenue was up 2.1% compared to the same quarter last year. Several other research analysts also recently weighed in on WFC. Zacks Investment Research upgraded Wells Fargo & Co. from a “sell” rating to a “hold” rating in a research note on Friday, June 24th. Argus restated a “buy” rating and issued a $58.00 price target on shares of Wells Fargo & Co. in a research note on Monday, June 27th. Deutsche Bank AG restated a “buy” rating on shares of Wells Fargo & Co. in a research note on Sunday, June 26th. 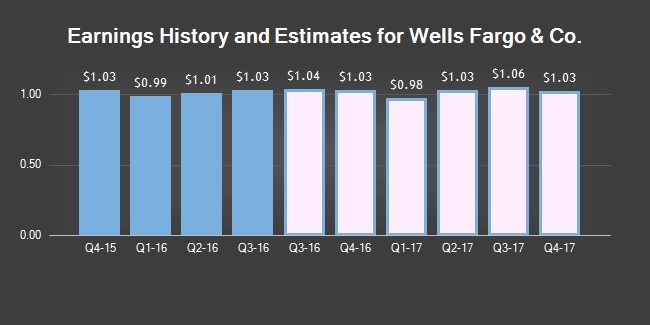 Vetr downgraded Wells Fargo & Co. from a “strong-buy” rating to a “buy” rating and set a $51.06 price target for the company. in a research note on Wednesday, July 6th. Finally, Jefferies Group restated a “buy” rating and issued a $53.00 price target on shares of Wells Fargo & Co. in a research note on Thursday, July 7th. Seven research analysts have rated the stock with a sell rating, ten have given a hold rating and seventeen have assigned a buy rating to the company’s stock. Wells Fargo & Co. presently has an average rating of “Hold” and a consensus price target of $49.49. Wells Fargo & Co. (NYSE:WFC) opened at 44.93 on Thursday. The stock has a market capitalization of $225.72 billion, a P/E ratio of 11.15 and a beta of 0.91. Wells Fargo & Co. has a 52 week low of $43.55 and a 52 week high of $56.34. The company has a 50 day moving average of $46.15 and a 200 day moving average of $47.96.